60 - 120 Gallon Storage Tank for Commercial / Whole House Reverse Osmosis System. 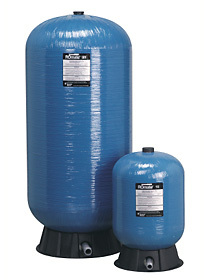 Pressurized, more than one tank can be used to increase storage capacity. Produced using NSF and/or FDA listed materials. Meets stringent US requirements for water components. Will not introduce chemicals or elements into water. Pre-installed inlet-outlet assembly, reduces installation time and cost. 86 gallons tank may be shipped as 86 or 87 gallon capacity.